If you want the ultimate asparagus experience, the time is now. People are talking at the market about this year's unusual weather. Spring officially started 3 weeks ago and the weather's been like we're about to enter the month of June! Aside from an amazingly flush selection of culinary herbs, promising fabulous workshops and inspiring great ideas for how to best put them in the spotlight, we see that the Asparagus is out. This is quite extraordinary, actually. If you cook with the seasons where you live, you might have already observed some things where you live being ahead of schedule. 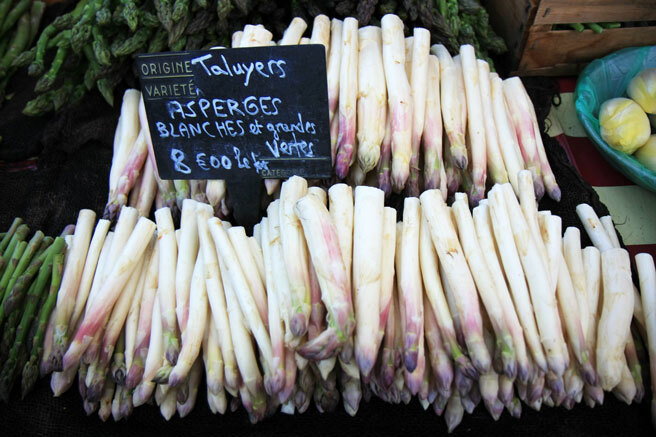 The producer's stands are piled high with crisp fresh spears here in Lyon. This won't last long. As the season evolves, the prices will drop as well as the quality, since the smaller stems are better eating than the larger ones. The producer of the asparagus pictured above confided that the early season is going to leave him in the lurch until his next wave of produce reaches maturity. I think also it was an excuse for charging such high prices for his product. I didn't hesitate to buy from him anyway, since he's got great produce at reasonable prices the rest of the year. We are eating his excellent asparagus either plain or lightly dressed with a lemon boosted green olive oil dressing, and with hollandaise. As the season wears on, soup is on the menu chez Vanel. Here's my sampling of French market menu uses for asparagus, one I refer to often when thinking of great ways to use it. 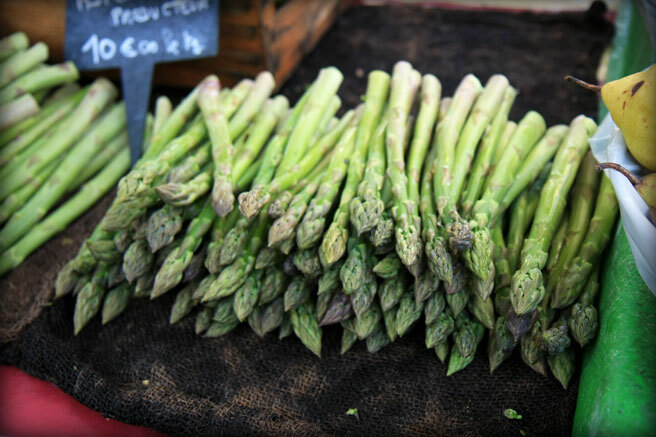 Green asparagus is kind of exotic in France, because traditionally the French only had white. This struck me as strange when I first arrived, having only had the green ones growing up. Ohm how I love asparagus. A few more weeks to wait, here, for a local crop, I think! Oh, those tiny pencilettes of green, beside the great sturdy fenceposts of white---what an array, and what a choice!! They both call for the best qualities of butter and lemon, and perhaps some gently-boiled eggs with the yolks retaining a bit of shine as they're quartered for the plate. I hope these are for your lunch today! And many, many thanks for the lovely note in your blog-list. I just saw it yesterday, and am honored to be included, both by you, and amongst such glorious names. He's charging 8 to 10 euros per kilo! Oh, comme je suis jalouse! It's been remarkably chilly here in New York, and so far the spring vegetable season has barely begun. We just got ramps last week, so I'm hoping asparagus will follow by Easter. Here in South Africa, we are reaping the last asparagus and loving them. How insanely beautiful your asparagus look! I am writing a post about asparagus right now and your photos are inspiring me. Now I just have to reconcile myself to the fact that shopping in a Washington DC grocery store won't be nearly as much fun as going to your French market. White asparagus would definitely be a novelty here in NYC.